Celebrating the Ladies Guild: 35 Years & Counting! Father Joe’s Villages’ Ladies Guild is more than just a volunteer group—its the place where camaraderie, hard work and compassion converge. Learn more about their impact over their 35 year history. When Father Joe Carroll was first appointed as director in 1982, Father Joe developed a plan to recruit women from San Diego parishes to help him expand services for neighbor in need. 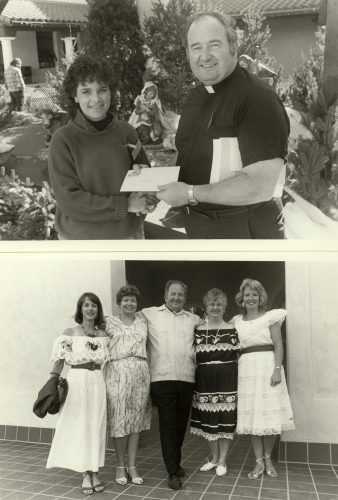 When Father Joe Carroll was first appointed as director in 1982, Father Joe developed a plan to recruit women from San Diego parishes to help him expand services for neighbor in need. In 1983 these women became a Ladies of Charity Auxiliary to the St. Vincent de Paul Center. The international parent volunteer group Ladies of Charity had been founded by Saint Vincent de Paul in 1617 to serve the poor. Sharing their skills as homemakers, mothers, doctors, nurses, accountants, teachers and more, one of the Auxiliary members first responsibilities included addressing mailings for fundraising events such as “The Miracle on 15th Street” charity dinner at the Hotel del Coronado, and “Room at the Inn,” a progressive party which featured refreshments and viewing 140 of Father Joe’s nativity sets at three of their neighborhood homes. After the Joan Kroc Center was built, Auxiliary members also volunteered to help women at the JKC prepare for job interviews with tips on grooming and makeup, gave docent tours of the JKC wearing their distinctive vests, and knitted layette items to give the new mothers in residence. In addition, they clipped thousands of Campbell soup can labels and hosted Halloween parties for JKC children and parents including those brought in by van from surrounding hotels. 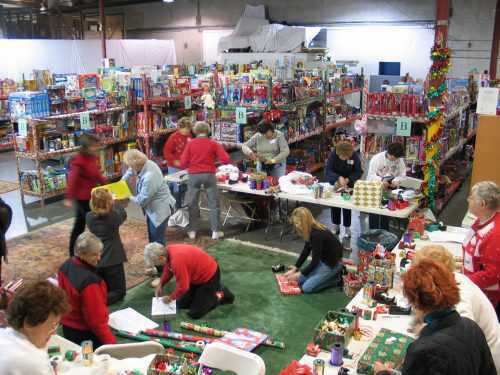 Ladies Guild members worked tirelessly to transform an empty warehouse into a magical “Santa’s Workshop” each year until 2011. One of their most notable feats was achieved, for the first time, in December, 1990. Members worked five days to set up a “toy store” for residents to choose Christmas presents for their children. Ladies Guild members worked tirelessly to transform an empty warehouse into a magical “Santa’s Workshop” each year until 2011 when staff and Ladies Guild members decided to move yearly Christmas shopping to the local Target store, with Ladies Guild member by the parents’ side shopping and helping wrap gifts. Attentive to their own needs, members also participated in annual Days of Recollection, sometimes held at the Benedictine Convent of Perpetual Adoration on Paducah Drive (now the Diocesan Pastoral Center). Father and the St. Vincent de Paul Center hosted its first volunteer appreciation event in 1989, calling it a “Hoedown with Western Buffet.” Appreciation events continue to this day. 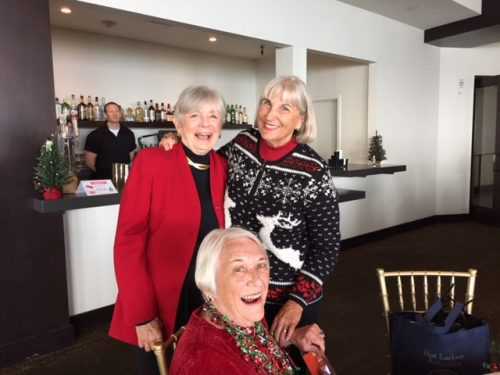 The transition from the Ladies of Charity to the Village Ladies Guild began in 1993 when its national organization decided to increase the annual dues and expected more support for its international projects. “We were a unique volunteer group and wanted to serve only the Village. We discussed going independent with Father Joe and he agreed. Since the Saint Vincent de Paul Center had just changed its name to St. Vincent de Paul Village, our members voted to become the St. Vincent de Paul Village Ladies Guild,” explains Dottie Cunningham, past Ladies’ Guild president and current member. 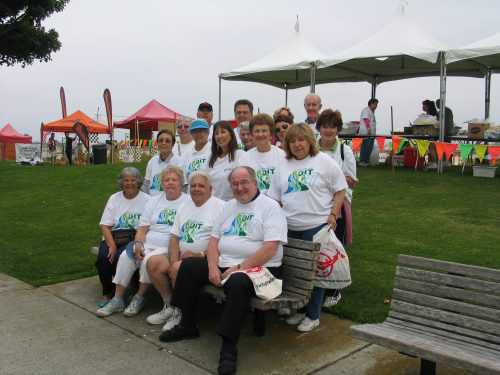 Over the years, guild members have volunteered at events such as at the San Diego International Triathlon. Guild members have continued volunteering, sometimes at venues beyond the Village such as at the San Diego International Triathlon, the 11th green of the 2008 U. S. Open at the Torrey Pines Golf Course, and the Thanksgiving Day Run/Walk in Balboa Park. For a non-profit such as St. Vincent de Paul Village, documenting the number of hours its volunteers work in a year is very important. “It represents the money the Village would have to pay staff to do what Guild members do,” says Judy McGreevy, who has for years persistently urged members to record their hours on the annual “time card” she distributes to them. 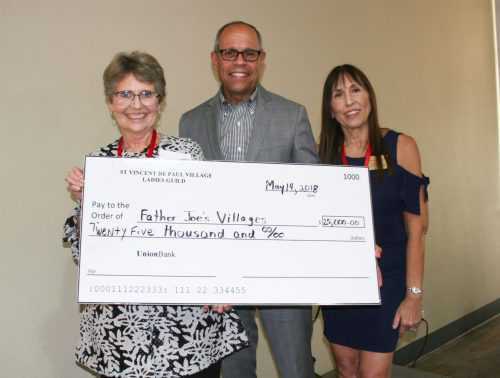 Every year, the Ladies’ Guild presents a “check” to Deacon Jim Vargas, CEO of Father Joe’s Villages. For Nancy Brickson, her satisfaction derives from the times she helped Village residents shop for Easter outfits for their children and afterward sat and had coffee with them. One young mother’s ambition greatly impressed her because the mom had wanted to make a better life for herself when she chose to leave a home where people were involved in drugs.